Cherry Mobile has announced their BIGATEN promo in celebration of its 10th anniversary. Through its anniversary sale, consumers can score a new Cherry Mobile device for as low as Php1,010! 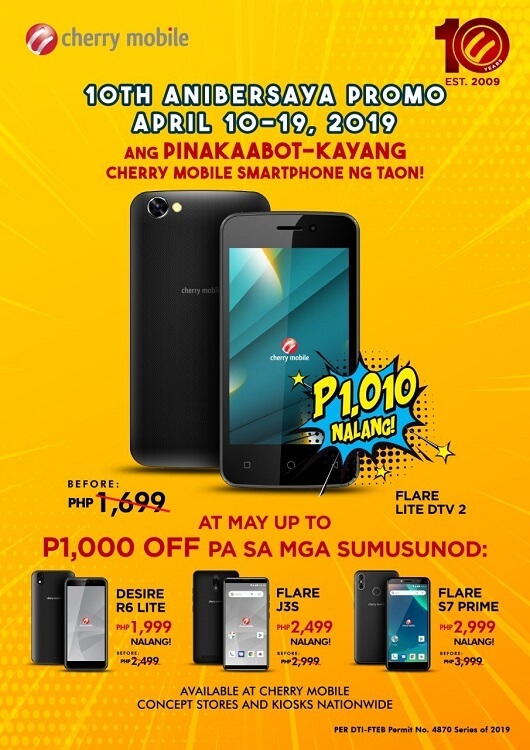 Happening on April 10 to 19, 2019, Cherry Mobile will allow consumers to have their own smartphone without having to spend too much bucks. Sounds like a deal, isn’t it? Participating devices include the Flare Lite DTV 2, Desire R6 Lite, Flare J3s, and Flare S7 Prime. You can get these handsets at its discounted price during its promo period at Cherry Mobile concept stores and kiosks nationwide. So, are you getting one? Let us know what you think!